Get ready to roar ladies and gents – on 14 February 2010, we entered the Chinese Year of the Tiger. The tiger is dynamic, powerful, unpredictable, courageous and explosive, so expect a turbulent year full of big changes. In terms of your health, it’s a year to be proactive so you can ride out the storm. In the Chinese calendar, 2010 is represented by the elements metal and wood. Metal corresponds to the lungs, colon, skin and immune system so this year you may be more prone to sinus problems, infections, asthma, bronchitis, pneumonia, bowel problems, rashes, compromised immunity, arthritis and eczema. The wood element correlates to the liver, gall bladder and nervous system, which means 2010 may be bring increased stress and tension, depression, anxiety, gallstones, hepatitis and cirrhosis. Combat this by eating foods that cleanse the liver, such as green leafy veg, carrot, beetroot and soy beans. Herbs and spices like dill, oregano, rosemary, sage, peppermint, turmeric, basil, coriander, fennel, anise, cardamom, ginger and parsley all boost the immune system. And I know it’s boring, but reducing your intake of dairy, alcohol, caffeine, sugar, wheat, deep fried and fatty foods, processed and refined foods will help too. Regular exercise that strengthens the respiratory and cardiovascular systems, such as yoga and qigong, as well as breathing exercises and walking in the fresh air also can help you feel tip top at tiger time. ‘Til next time, take care tigers – it’s jungle out there. This entry was posted in breathing exercises, Diet and nutrition, immune system, Relaxation and fitness, TCM on 17 February 2010 by Bec Cavalôt. Excellent news! Just in time for Valentine’s Day, I can reveal that chocolate, the proper posh dark stuff, really is good for you. OK, so it’s no big secret – most of us already know that dark chocolate, like red wine, blueberries, spinach and green tea, is full of antioxidants, which can prevent or slow oxidative damage to our body. But a Canadian review based on three recent studies has also found a link between eating dark chocolate and a lower risk of stroke or death after a stroke. One study found that the stroke rate was 22% lower in people who ate chocolate once a week. Another found that death from stroke was 46% lower in those who ate 50g of chocolate once a week. 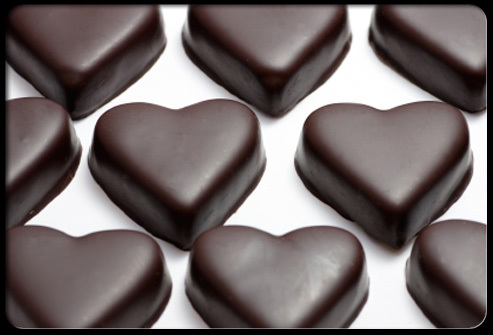 Many nutritionists agree that a little dark chocolate is good for heart health. The benefits come through the flavonoids in cacao beans, which reduce fats and prevent blockage of the arteries. In a separate 2009 study, researchers found that dark chocolate could also reduce emotional stress. Participants who were given 40g of dark chocolate every day for two weeks were found to have reduced levels of the stress hormone cortisol, as well as other stress chemicals. This entry was posted in antioxidants, chocolate, Diet and nutrition, stress, stroke on 12 February 2010 by Bec Cavalôt. I’ve suffered on and off from lower back pain for a while and being 6 months pregnant isn’t helping much. I‘m doing yoga, taking vitamins and avoiding heavy lifting, but I’m a bit wary about treatments that rely on snapping and cracking my spine back into shape. I need a gentler touch. A couple of years ago I was introduced to Bowen Therapy by a friend who used me as a guinea pig whilst training to become a practitioner. I love a local treatment and it doesn’t come much more ‘local’ than Bowen; Geelong’s Tom Bowen developed this holistic and non-intrusive therapy around 50 years ago. Bowen is safe for everyone, from children and pregnant women to arthritis sufferers and the elderly, and can be carried out directly on the body or through clothing. Some people only require few treatments and others use Bowen regularly for general health maintenance. During a session, the practitioner performs a series of gentle moves across fascia or soft tissue associated with particular muscle groups, tendons, ligaments or nerves. After each movement, the therapist leaves the room or pauses for the muscles to realign, allowing the body to respond and the healing process to begin. On the day of the treatment, drink lots of water and abstain from rigorous exercise. Your Bowen therapist may also recommend exercises and stretches to maximise the potential effects of the treatment. Bowen is a bit of a ‘cure all’ and can be used for musculoskeletal injuries, frozen shoulder, headaches, abdominal and digestive issues, fatigue, insomnia, stress and back and neck pain. If you’d like to give it a try, I’d recommend the lovely Nina George who’s based in Port Melbourne. This entry was posted in back pain, massage, Natural therapies on 5 February 2010 by Bec Cavalôt. Recently, I wrote a couple of articles for the wonderful WellBeing magazine on music and singing as ‘medicine’ for both body and soul. I’ve had a fair bit of feedback about these articles so thought I’d pop the PDFs up on my website so you can have a read. This entry was posted in music and singing for health, Natural therapies on 1 February 2010 by Bec Cavalôt.